In the slow cooker, add the chicken tenderloins, diced tomatoes, and half of the taco seasoning. When the chicken is cooked through, use two forks to shred the chicken. Cook the rice to package directions. When the rice is just about done cooking, add the rest of the taco seasoning to it. While the rice is cooking, combine the drained beans, corn, and lime juice in a pan. Saute on medium heat until beans and corn are hot. 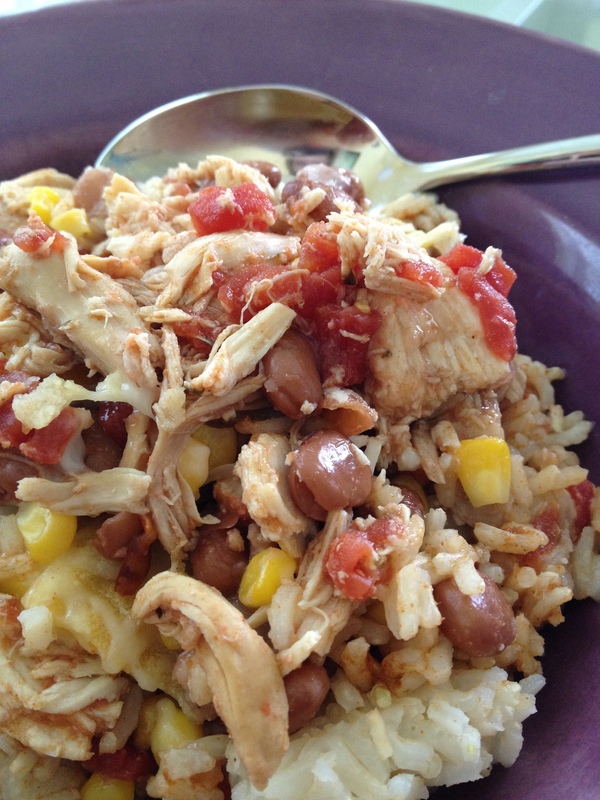 In a casserole dish, layer the rice, chicken mixture, and beans and corn on top. Bake at 350 degrees for 15-20 minutes. Serve hot, and top with cheese if desired. I love cooking and spending time in the kitchen, but sometimes weeknights are hard even for someone who loves to cook! Stir fries are always quick and easy, and this one is particularly flavorful. I made it vegetarian, but you can add your favorite protein… cubed chicken, steak, or tofu. Also, these are my favorite flavors, but feel free to create your own and enjoy! Just make sure the veggies don’t get too mushy… that can totally ruin a flavorful stir fry. This recipe makes several meals. While rice is cooking, add sliced celery, carrots, and onion to a large sauté pan with 1 tbsp. olive oil. Let them sweat for a few minutes and start to soften. Add the red and green pepper strips and continue to sauté just until veggies are barely soft. Add the snap peas, green peas, and corn. Add the soy sauce, ginger, honey, and orange zest. Stir to combine. Continue stirring until well combined and heated through. When just about done, add the cooked white rice and stir through. 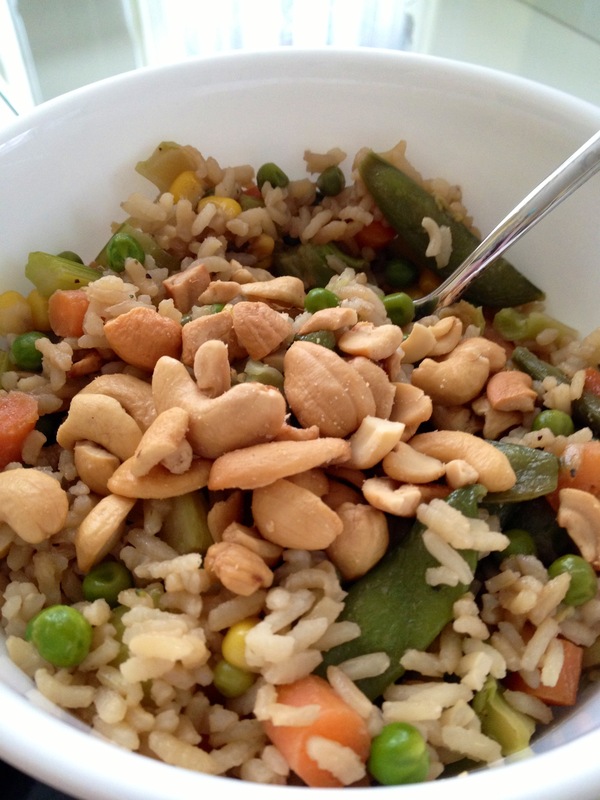 Top with chopped cashews and enjoy! After a few years, I have gotten to know my allergies pretty well. I know that I am very sensitive to gluten and that I won’t risk it for any meal. Dairy, on the other hand, I push around sometimes, but only with cheese. I have found there just is no good enough substitute for cheese. I have also heard that hard cheeses are easier for those with a dairy allergy to digest. So, I know that goat cheese and I are friends… and this week I tried blue cheese. In a small amount, we got along… and the intestinal side effects I could deal with. So, here is a recipe for a great cobb salad that I made this week! This recipe makes about 4 good sized salads. Cut the potatoes into sixths and steam them. Steam just until fork tender, but not mushy. Drain the can of corn niblets. In a medium sauté the turkey bacon until desired crispness. 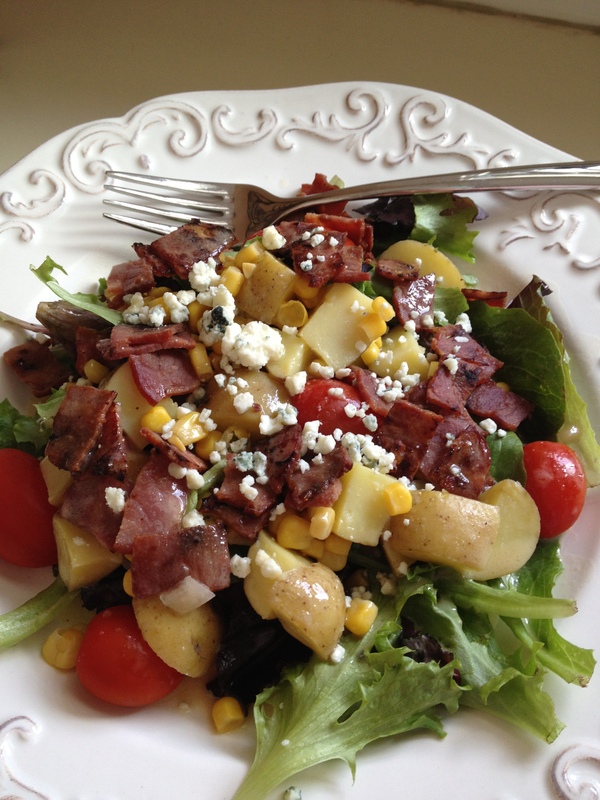 On a plate, arrange lettuce and top with cherry tomatoes, potatoes, corn, turkey bacon, and blue cheese crumbles. To make Honey Dijon dressing, whisk together the olive oil, white wine vinegar, red onion, Dijon mustard, honey, and lemon pepper until combined. Pour over the salad. I usually make my lunches for the week on Sundays, and usually make the same thing for the entire week. I can put it together in the morning and don’t have to think about it because the prep work is already done. 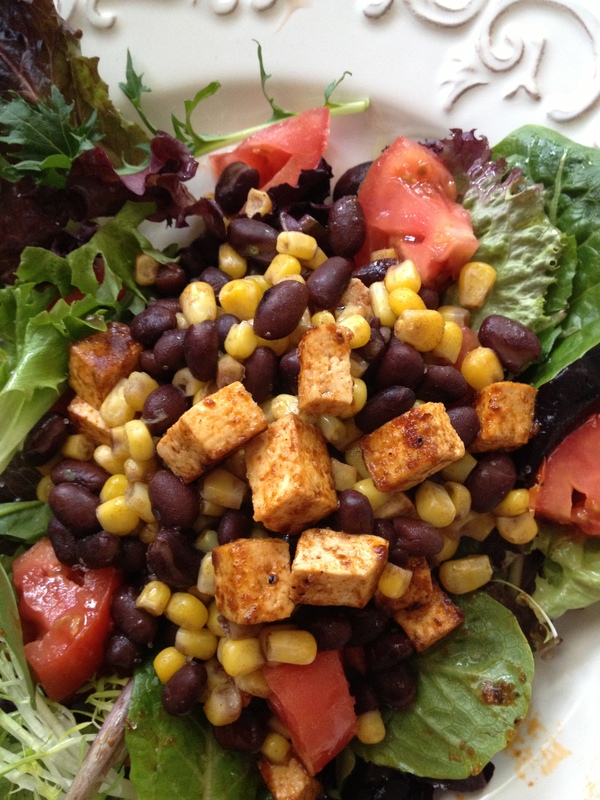 This week, I made a BBQ Tofu Salad and it was SO good! If you don’t like tofu, you could easily make this recipe with chicken. It could also make for a healthy weeknight dinner. Drain the tofu very well. In a large sauté pan, add the tofu and 4 tbsp. of your favorite BBQ sauce. Saute the tofu over medium heat in the BBQ sauce until it starts to get crispy. In another large sauté pan, add the drained black beans and corn. Add the lime juice, chili powder, and lime zest. Stir the corn and beans on medium heat for 15 minutes. To make each salad, make a large bed of lettuce. Top with corn and bean mixture, BBQ tofu, sliced tomato, and sliced avocado (if you wish). Dress with extra 1 tbsp. of BBQ sauce and extra 2 tsp. lime juice. 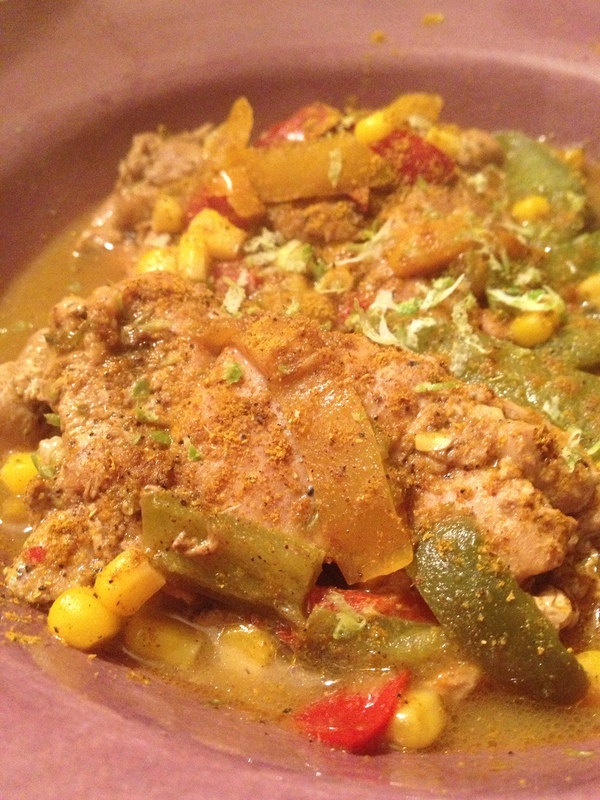 I LOVE curry chicken… the kind from your favorite local Thai restaurant. I love the color, flavor, and the sauce that just goes perfectly over white rice. Here is my first attempt at my own version. Not perfect, but decent flavor. I want to try again soon… any suggestions are welcomed! In a large sauté pan, add the oil, rice vinegar, and diced onion on medium heat. Stir for a few minutes to get hot. Add the chicken thighs. Season with salt and pepper. Crisp each side about 3 minutes, just to get the chicken browned. Add the curry powder, chili powder, ginger, parsley, and brown sugar to evenly to each side of the chicken. Add the corn, snap peas, pepper strips, and coconut milk. Cover and let simmer about 20 minutes, until chicken cooks through. Serve hot, over rice, and with grated lime zest on top. Sunday afternoons are when I clean the house, make lunches for the week, and enjoy some time to gear up for the always busy week. I do love cooking, but sometimes I also love just throwing some ingredients in the crockpot and letting it simmer while I enjoy my Sunday afternoon. So this week, I did just that. The result was a delicious Sunday night dinner with very little effort! In the crockpot, lay the chicken drumsticks in the chicken broth and smother the drummies with the garlic, orange juice, orange zest, soy sauce, smoked paprika, and salt and pepper. When the chicken is almost done, cook white rice according to package directions. When the rice is just about done cooking (with about 1-2 minutes left), add the frozen peas and corn and cook them in the rice. 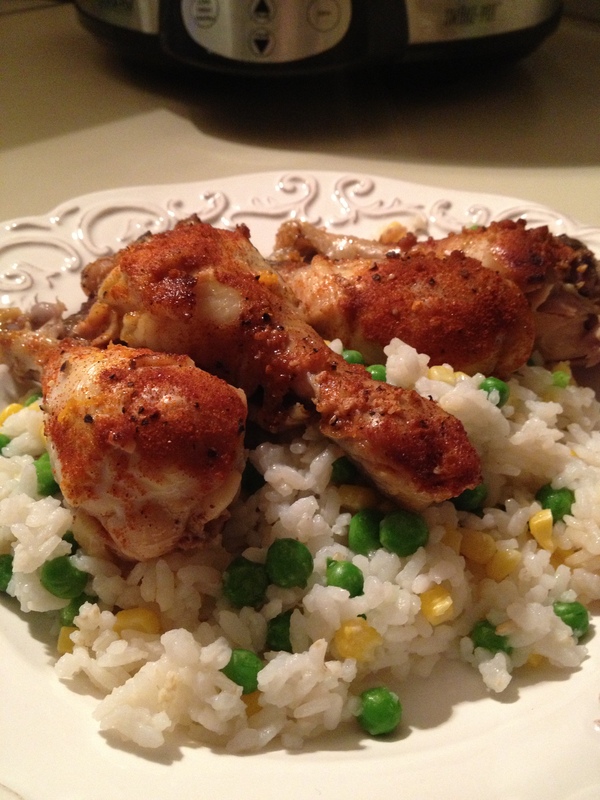 Serve the rice, corn, and peas in a bowl and top with the chicken drumsticks. While thinking of new fresh summer veggie combinations, I started cooking with corn and roasted red pepper. I really love the combination! It is so much cheaper to roast your own red pepper than buying the jarred kind… and really easy. This week, I roasted my own red peppers, chopped them up, added them to some frozen corn, and came up with three great side dishes! Cut the red peppers lengthwise, into fourths. That is, cut around the core. Lay each slice on a cookie sheet, with the skin facing up. Lightly drizzle with olive oil, or mist with olive oil. Bake at 375 degrees for about 40 minutes, until the edges begin to char. Let them cool, then peel off the skin with your fingers. It should peel off easily. Using the freshly roasted red peppers, I chopped them into small bit sized pieces. I then added the red pepper pieces to a bag of frozen corn, in a large pan. Heat over medium for about 20 minutes, until the corn thaws and heats. 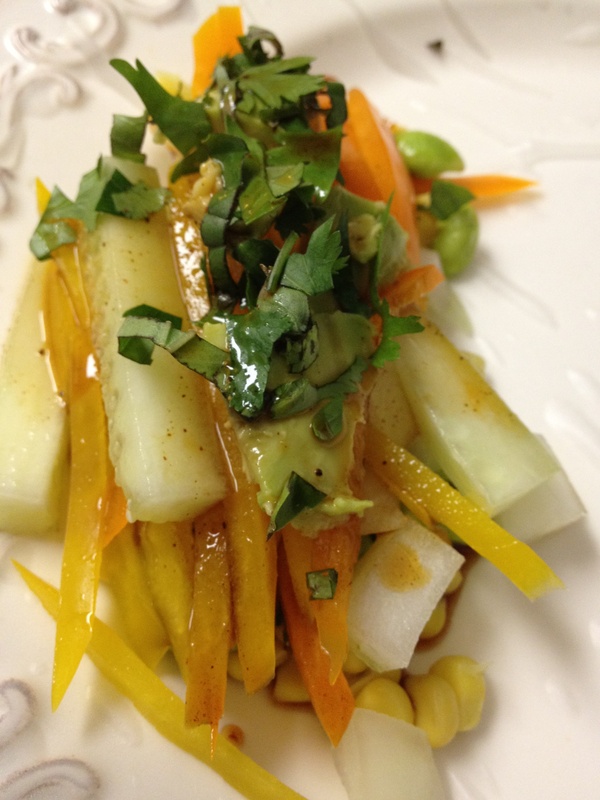 Add your favorite add ins, and you have a great summer salad! 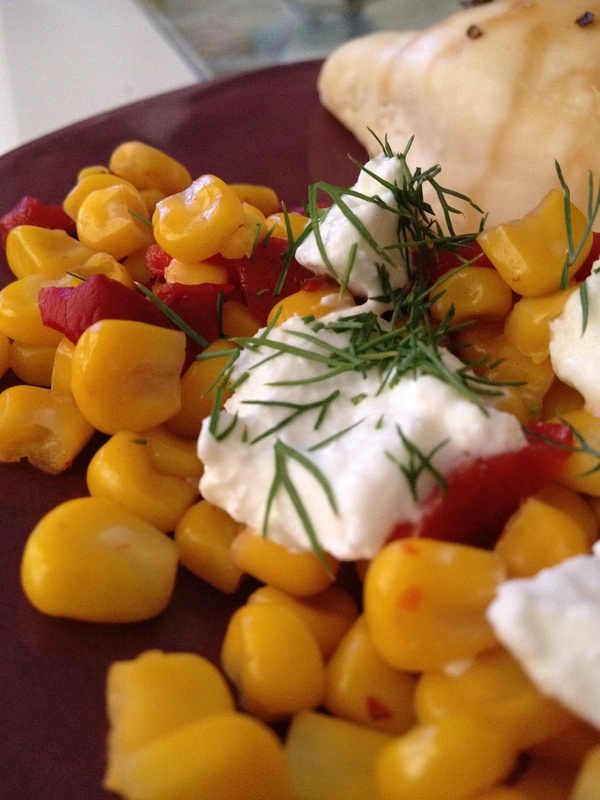 Corn and red pepper with goat cheese and dill. 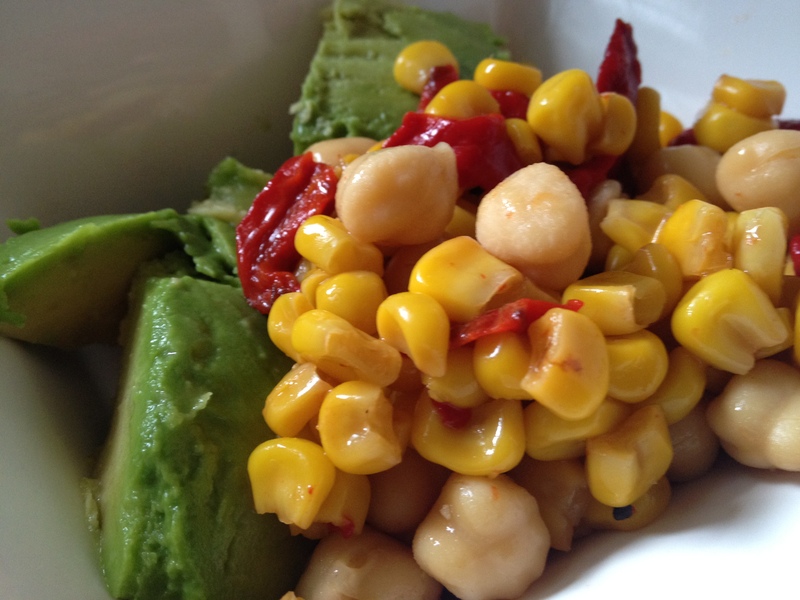 Corn and red pepper with avocado and chick peas. 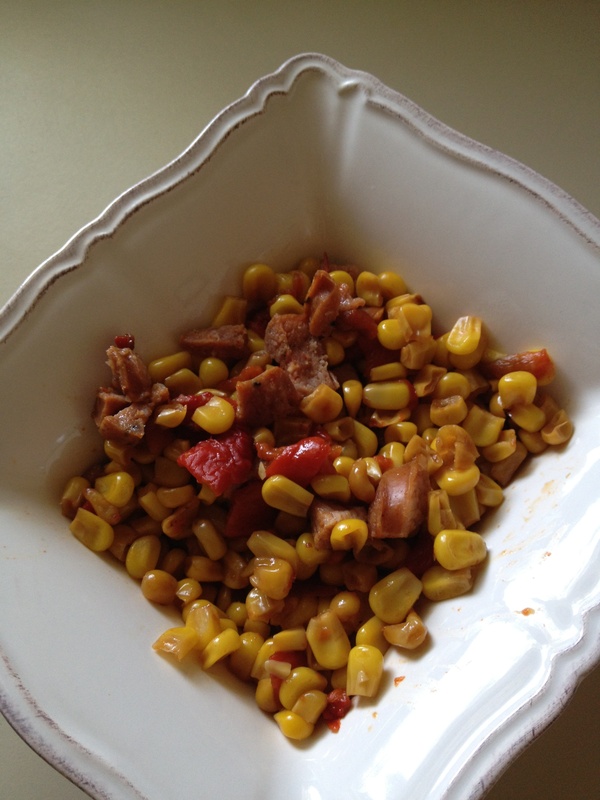 Corn and red pepper with spicy cajun sausage. The corn tortilla is a small round mystery to me. I love going out for Mexican food because corn tortillas are gluten free. In restaurants, the corn tortillas are an easy alternative to flour ones. But at home, I find that they just fall apart. So, I attempted one dish served two different ways to see which was best for the corn tortilla. Turns out, the bowl shape was best! In the crockpot, put the chicken, onion, peppers, 1 tsp. cumin, and 4 tbsp. green verde sauce. Cook on high for 2.5 hours. When the chicken is done, take it out of the crockpot and shred with two forks. 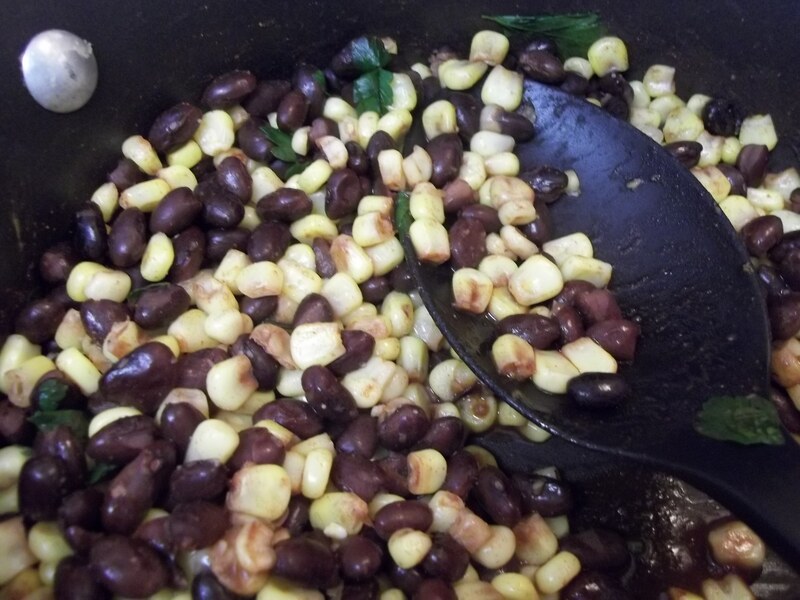 In a saute pan over medium heat, combine the corn, beans, 1 tsp. cumin, and lime juice. Cook just until heated through. 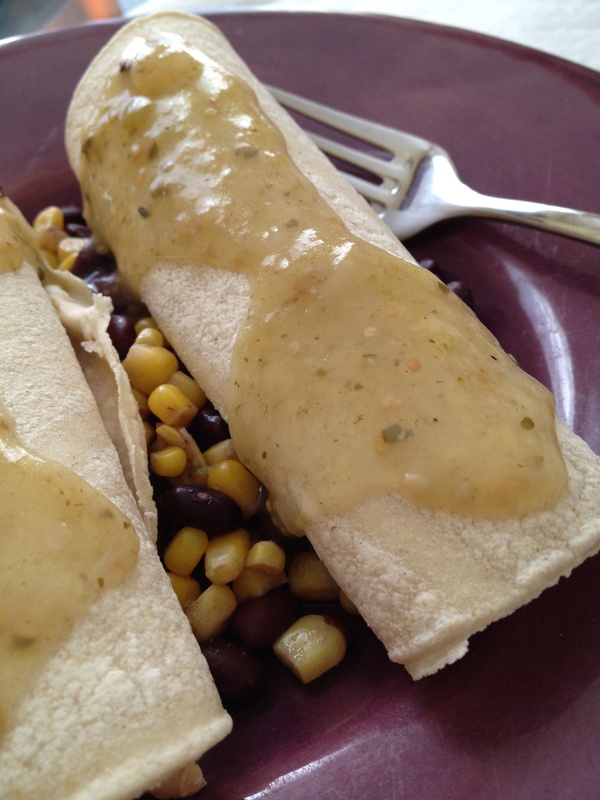 To serve, you can wrap the chicken mixture in a corn tortilla with an extra sprinkle of cumin and red pepper, place over a bed of corn and beans, and spread green verde sauce on top. Or, you can line a bowl with a corn tortilla, place corn and beans in it with the chicken mixture on top, and then dress with green verde sauce and a sprinkle of cumin and red pepper. 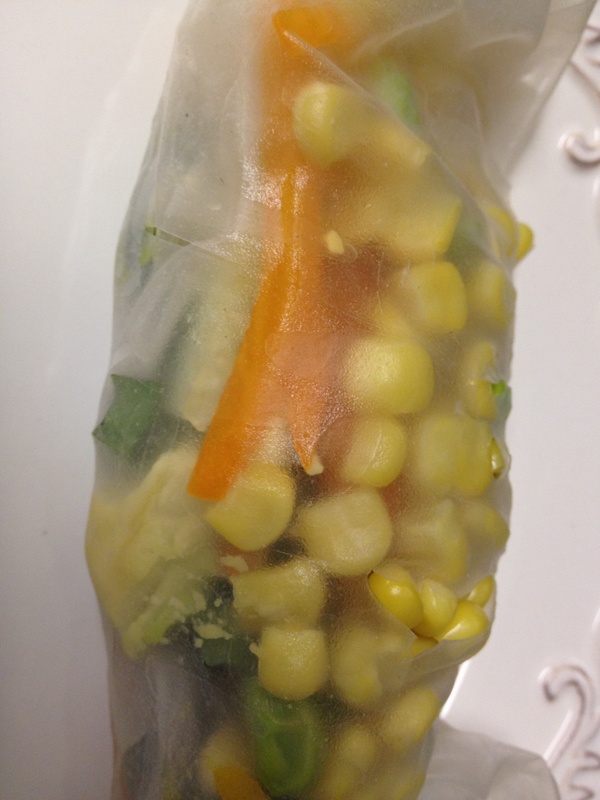 Inspired by gluten free rice products found in Asian cuisine, I took on the challenge of making Spring Rolls in rice wrappers. I made them with veggies, although putting grilled chicken in them would be just as good. I think I got the basic wrap down, but it will definitely take more practice to master. Those rice wrappers are tough! Overall, the flavor was really delicious… I think it was a combination of all the ingredients an totally worth it! I will definitely make these again. Chop the peppers, cucumber, avocado, and defrost the corn and edamame. In a bowl, mix together the soy sauce, orange juice, lemon juice, lime juice, ginger, and cumin. Chop the basil, cilantro, and parsley and set aside. Fill a large saute pan with warm water. Dip each rice wrapper in the water for 13 seconds (the magic number!) and place on a plate. Pat dry with a paper towel. 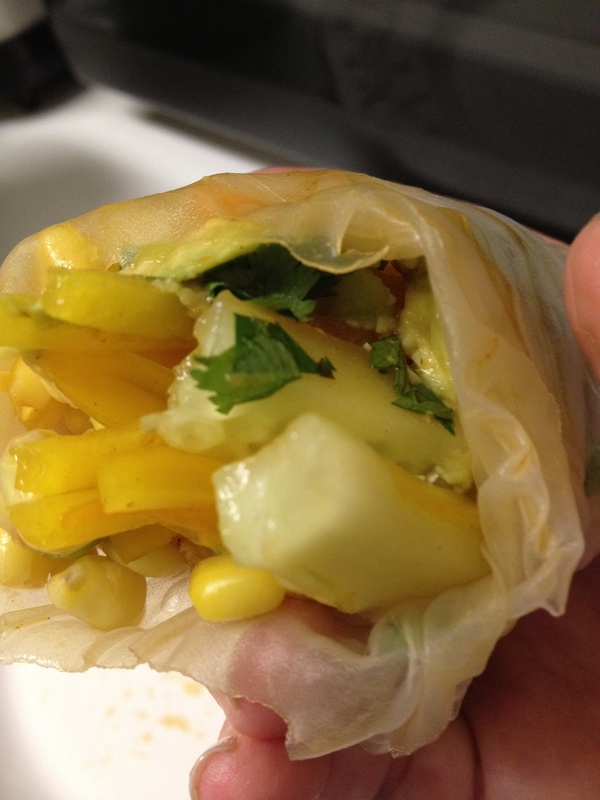 At the bottom edge of the wrapper, place the peppers, cucumber, avocado, corn, and edamame. Sprinkle with chopped herbs. Drizzle one teaspoon of sauce over the mixture. Fold in the sides of the wrapper, then wrap up like a burrito. Eat as is, or dip in more sauce. Enjoy! Last week, I made fajitas at home and never had a chance to share them! I like making fajitas at home because you can add so much variety to them and really personalize your favorite flavors. 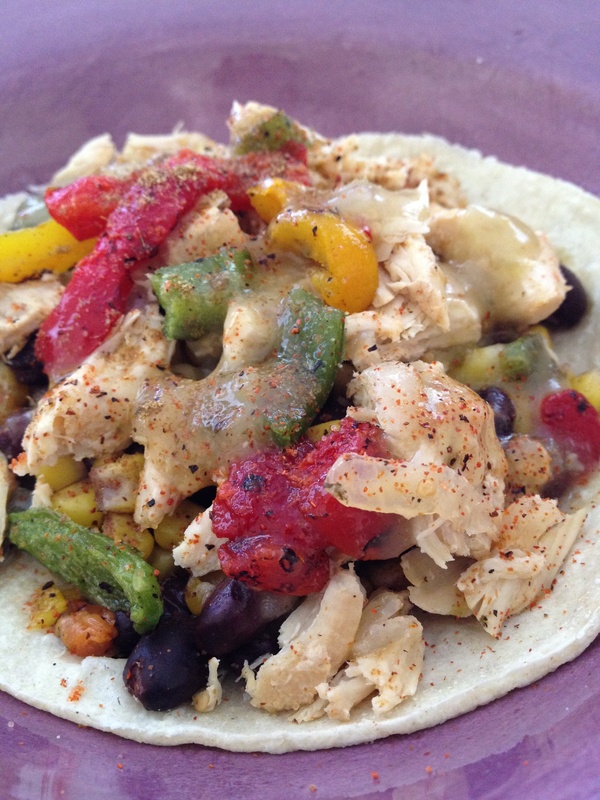 I am also finding that ethnic foods fit well with my diet, so fajitas were a great weeknight meal for me. In a large pan, add the beans, corn, lime juice, and paprika. Cover and put over medium heat. Stir every few minutes, until warmed through. Toss with a few handfuls of torn parsley. Serve on the side of fajitas, or right in the tortilla! 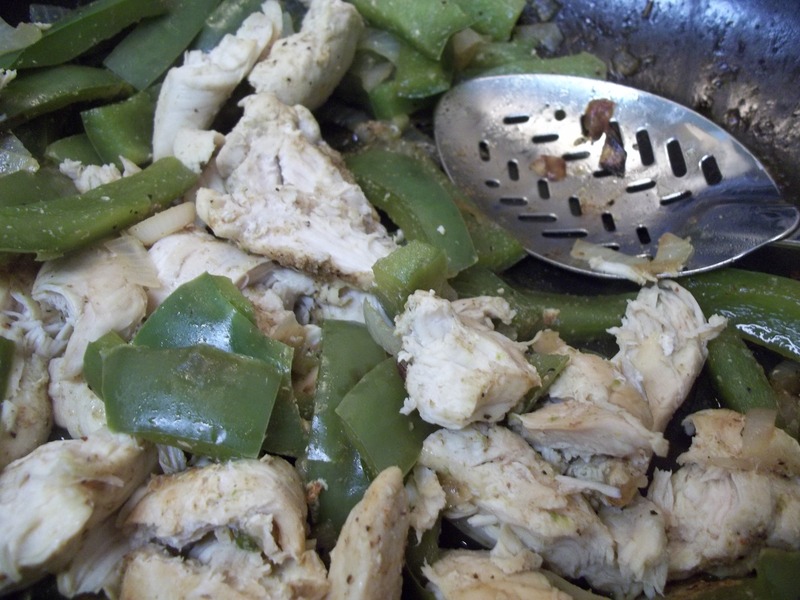 Then I sauteed chicken tenders and sliced green pepper and onions in a large saute pan with some olive oil. I added about 3 tbsp. lime juice, 2 tbsp. cumin, a sprinkle of salt, pepper, and garlic salt. Stir and cover for about 10 minutes, until chicken is cooked through and pepper and onions are tender. To assemble fajitas, I used warm white corn tortillas topped with smokey corn and beans, chicken with peppers and onions, mild salsa, and guacamole. So tasty, I couldn’t stop at just one! Ole!